Recycling and re-using waste from the home is one part of the recycling process. The materials that are sent for recycling are then made into more goods. 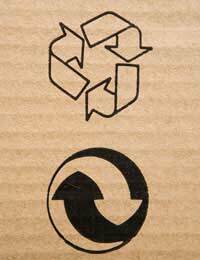 By buying products that are made from recycled materials the recycling process goes full circle. The more people that buy recycled products, the more will be made available and the more the price of the goods will drop. Buying recycled goods reduced the amount of materials being sent to landfill. The manufacture of recycled goods uses less energy and resources than making new products. The recycling industry creates jobs and vocational training opportunities. What Recycled Goods are Available? Aluminium foil made from…aluminium foil! Recycled products may be made completely or partly from waste. This waste may come from consumers’ recycling, waste that has been sent for landfill, or waste generated through manufacturing processes. Aren’t recycled goods a lot more expensive? The difference between the price of recycled and non-recycled goods is often negligible. As recycled goods grow in popularity, the price is also steadily falling. It’s in the interests of recycled goods sellers to price competitively if they are persuade consumers to make the switch. Where can I buy recycled goods? Recycled products are not hard to find and are increasingly widely available. They are often available in supermarkets and in high street shops. For those who live in more remote areas recycled goods can easily be bought online and delivered. Does the recycling process use more energy than new materials? This is a common misconception but isn’t true. Manufacturing products from recycled materials uses less primary raw materials and significantly less energy and water. Further, manufacturing recycled products creates less air and water pollution. Avoid unnecessary packaging. Our article on ‘How to Avoid Excess Packaging’ provides more information on this. Buy items loose where possible. If packaging is unavoidable buy items with recycled packaging. If the shops you regularly visit don’t stock recycled goods, ask them about the possibility of this. The customer is always right after all. Choose energy efficient products where possible, such as low energy light bulbs and rechargeable batteries. Avoid disposable products. Our article ‘Great Ways to Avoid Disposable Products’ provides ideas and tips on this. Buy organic and local produce if possible. Giving Your Used Goods to Charity: Does it All Get Used? i like to recycle it really good for the evierment and i like to know it is getting renewed every time.